And secondly, as a nice wee segway, I can’t think of a better reward for all you caring foodies than to give you the recipe for the ultimate instant satisfaction meal. I say meal because this recipe works great as breakfast, lunch, dessert, even dinner if you want. 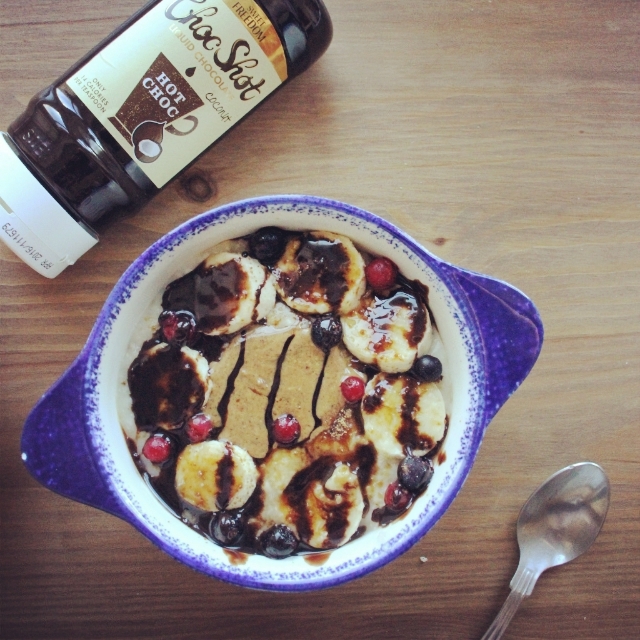 3 ingredients + 5 minutes = instant happiness. Plus it’s vegan and almost entirely raw! I know I’m late to the nice cream train — and for those of you even further behind, that’s ‘banana’ + ‘ice cream’ = ‘nice cream’ — but hey, it’s as delicious now as it was a year ago so I figured it worth sharing anyway. You all know I’m a fan of Choc Shot, produced by the award-winning Sweet Freedom. From the first moment I tried their liquid chocolate, I was hooked. Now the lovely people at Sweet Freedom have come up with two new flavours that are blowing my mind (we’re talking me just opening up my gob and eating the stuff straight out of the bottle) (help, I need an intervention!) because they are so good, and so addictive. Choc Shot Orange Spice and Coconut are the two new flavours making it way too easy for me to include chocolate in pretty much every meal I make. 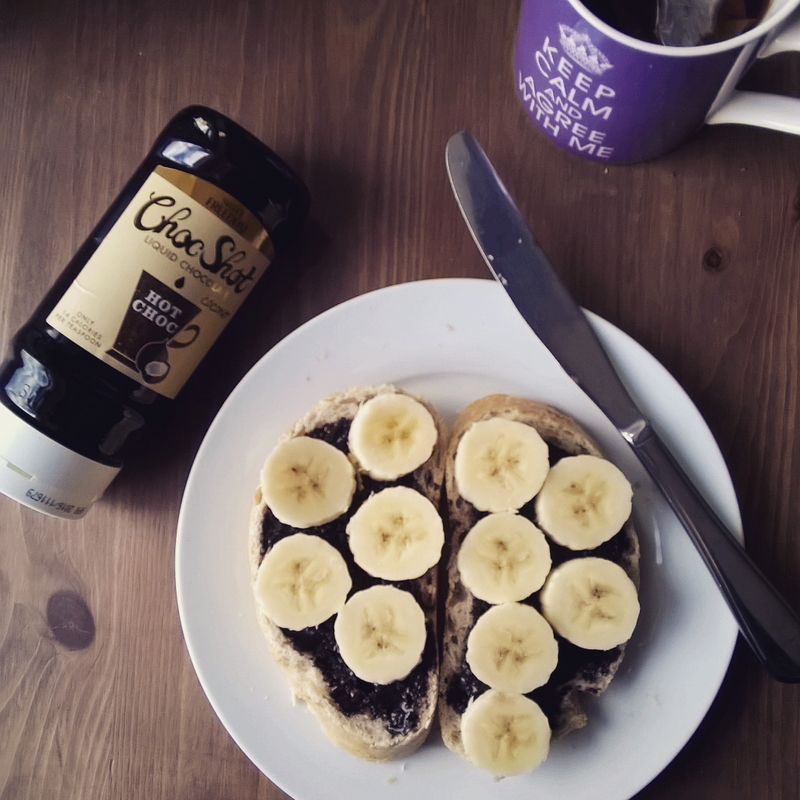 I drizzle it onto porridge, pancakes, toast, nice cream, espresso ice cream, or blend it into my smoothies for a chocolatey start to the day. And it’s healthy, too: the ingredients are simply natural fruit extracts, cocoa powder, rapeseed oil, water and natural flavours. That’s it! It’s also great to drizzle into milkshakes to jazz ’em up a little. 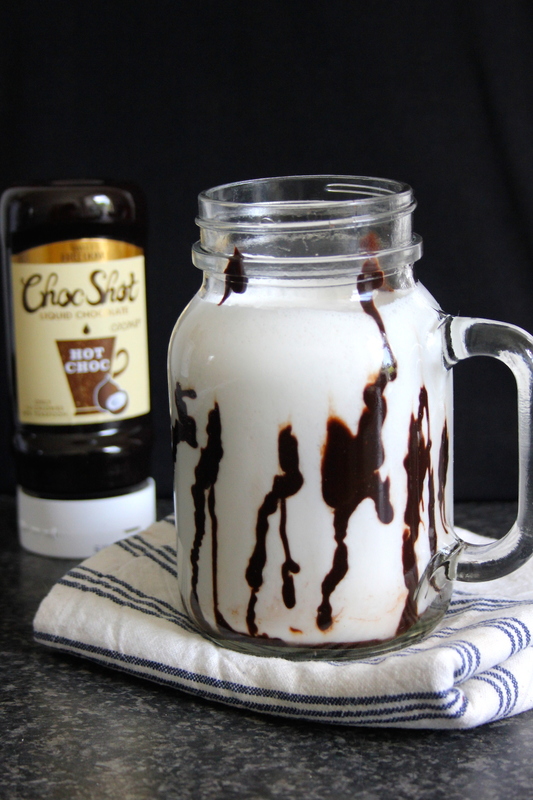 Watch out for my Coconut & Choc Shot Drizzle Milkshake recipe in next month’s The Vegan Kind subscription box! 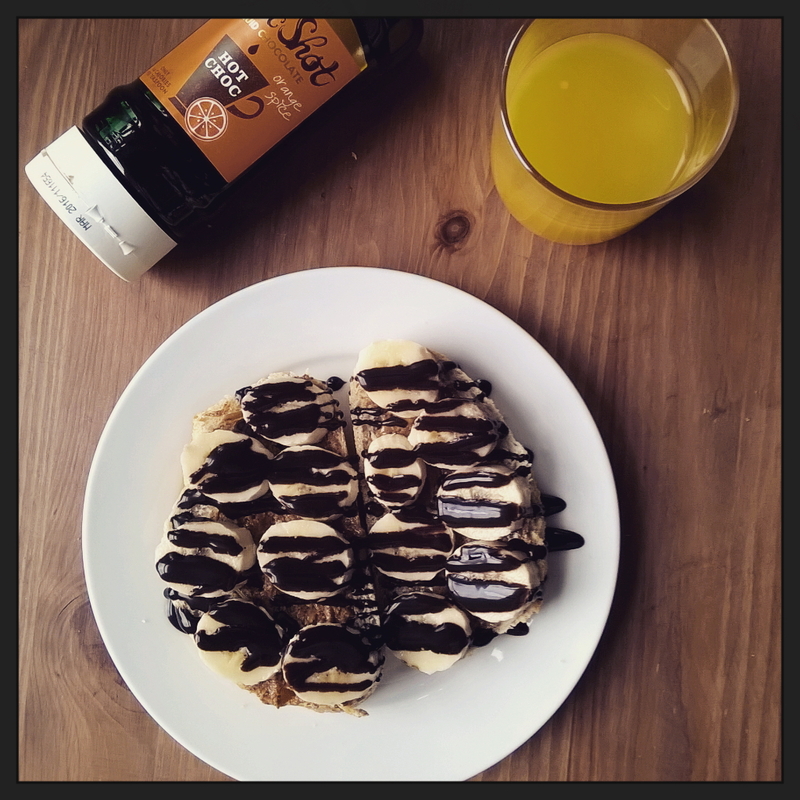 Choc Shot Orange Spice and Coconut are now available in the UK in Holland & Barrett. They also make delicious sweeteners,, and what I love most about them is that they are made only from natural plant extracts, so it’s suitable for low GI diets. 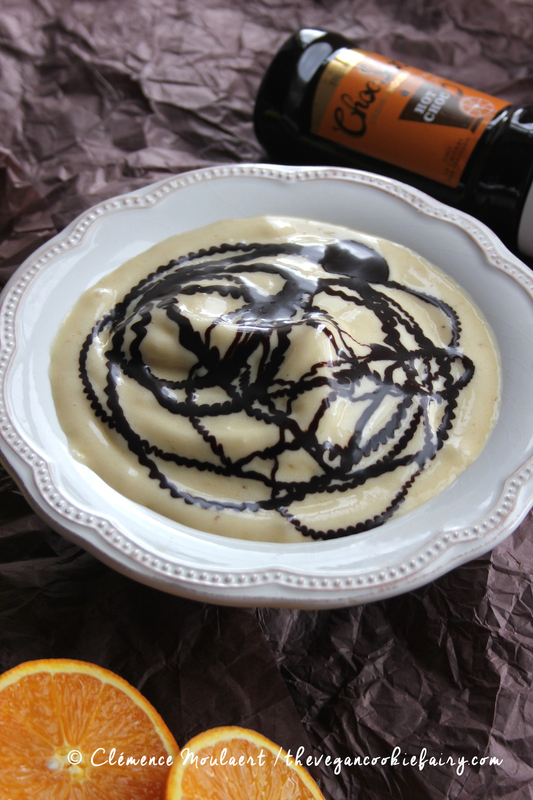 Blend the frozen banana and orange juice in a high speed blender, or food processor, until smooth. It might help your blender if you add in the pieces of frozen banana a little at a time, especially if you don’t have a high-speed machine. 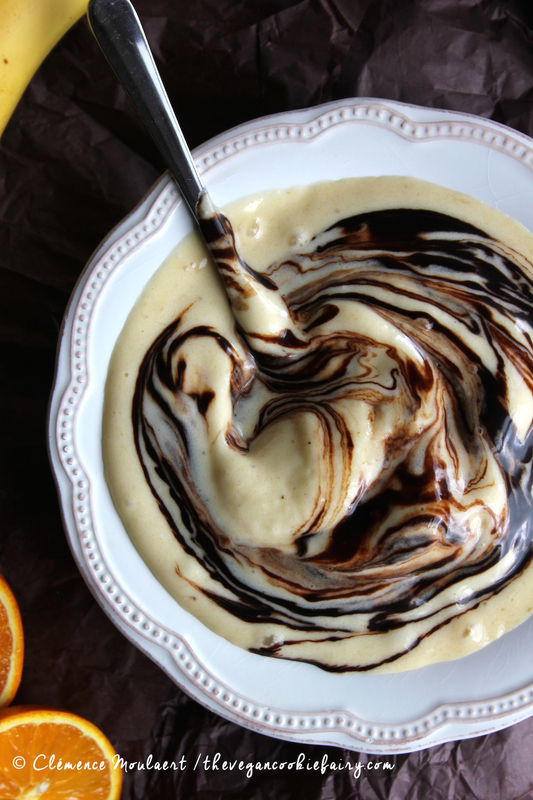 Pour the ‘ice cream’ into a large bowl and drizzle with as much Choc Shot Orange & Cardamom as you like! Have you tried Choc Shot yet? What do you think of it? Disclaimer: this is sponsored by Choc Shot Orange Spice and Coconut, but, as always, all opinions are my own and I think Choc Shot is fabulous.